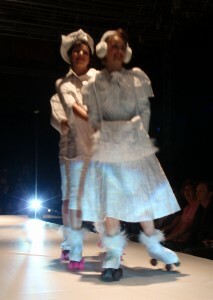 I was lucky enough to be invited by my journalist flatmate Olly to go and watch a show as part of Brighton Fashion Week. 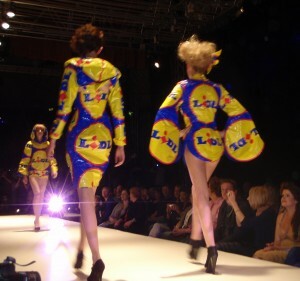 The show was entitled ‘The Trashion Show’ and involved an unusual but beautiful collection of garments created out of everyday household items and packaging. The show was fast paced and very theatrical, with dancers working alongside the models and there were even some skaters in the show (although they didn’t look very comfortable on their stops and turns) and I worried about them falling off the runway. Most exciting was just sitting in the front row and having such a great view. The VIP after party was also an eclectic mix of Brighton personalities. I met two authors, a model (whose massive hair got tangled with mine in the wind), a jewellery designer and a kite surfing instructor. I’m sad to be missing the Couture Show this weekend but London (and work) calls…..
My personal favourite was the ice skating Barbie dress. We may have to look at revamping the summer Skatefresh uniform…..